There is none (although see below for theories). It may help to recall briefly what the Torah, the five books, also called the Pentateuch, say. In the first book, known as Genesis to the Greeks, which means the Beginning, Abraham is an ordinary citizen who is born in Ur, which is ruled by the Chaldeans. Ur is in Sumeria in Mesopotamia. He then travels a long way with his family to Canaan and then south to the Negeb peninsula. There he lives for some time, but due to a famine decides to move to Egypt. All this time he is presumably an ordinary citizen. In Egypt, Abraham's wife becomes the consort of the Pharaoh, so Abraham is richly rewarded, but bad omens befall the Pharaoh so Abraham leaves and goes back to the Negeb. Eventually, his progeny return to Egypt and his great grandson, Joseph, becomes a powerful minister in Egypt. There ends the story of the first patriarchs. As we can see from this story, everything revolves around Abraham and his family who are essentially private individuals, therefore, there is no reason we should expect to have any archaeological evidence of their having existed no more than we have the evidence of any number of millions of other private people that lived during those times. The first of them that might have a record of any kind is Joseph, who is reputedly a high minister in Egypt. However, the identification of Joseph with any archaeologically known person is highly conjectural. In this respect there is a book "The Hebrew Pharaohs of Egypt: The Secret Lineage of the Patriarch Joseph" by Ahmed Osman. 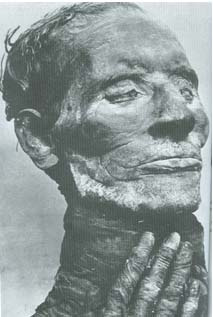 In Osman's book he conjectures that Joseph is the same person as Yuya, prime minister of the 18th dynasty pharaoh Tuthmose IV, and he gives various evidence supporting this theory. However, at the end of the day it is difficult to prove this theory one way or another. Was Yuya Joseph? That's the theory of Osman's book. Not the answer you're looking for? Browse other questions tagged ancient-history judaism or ask your own question. Can the new testament be a valid historical record on the real life of Jesus? Was the grooming ritual of clipping one's toe/fingernails common practice in the ancient civilizations of the Mediterranean/Mesopotamia? What do we currently know about the ethnic origins of Jews?